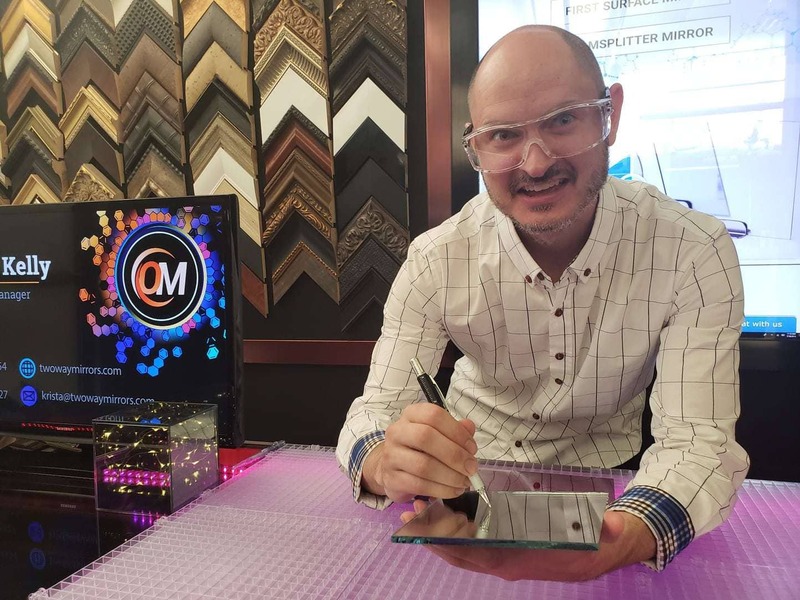 With 20 years experience manufacturing mirrors, James leads our team of engineers & glaziers and has the expertise to quickly and accurately answer any questions you have. Discouraged by outdated teleprompting software? With just a click of a remote, literally capitalize your efforts with this hack! Teleprompters were invented in the late 1940’s to streamline video production by keeping the speaker on cue. Nearly 70 years later, we want to revolutionize this idea! With just a fraction of the cost, we showcase in this demonstration how consumers can efficiently teleprompt while utilizing their own television and maximizing optical quality paired with our Dielectric Beamsplitter Mirror! 7 Step Walk-Through to Mirror Flip your TV Screen! Power back on to see the effect! Need to flip your laptop or tablet screen? Throw out that daunting expensive software and use these top 3 tricks provided by engineer James Baker! Try a front surface mirror for reflection precision, or highly recommended optical grade beamsplitter. What if you prefer not to use mirrors or software? We offer our HDMI Mirror Box. Just plug it in and ready to use without hassle! Our Solution to Mirror Flip your Laptop Screen without Software! We offer various dome sizes to fulfill your security and safety purposes. Highly reflective on the outside so intruders can not see the angle of camera direction. While transparent enough for maintaining quality video surveillance. Ability to regulate hallway traffic easily in schools, hospitals, or warehouses. Our Two Way Mirror Dome is suitable for any business! Two Way Mirror Dome Quick Facts! Protecting your optical mirrors is important! Are you unsure of which products to use? Perhaps your in between uses and want to safely store or ship? Follow these tips to keep your<strong><em> First Surface Mirror</em></strong> looking sharp and pristine! Recommended Tools for Optimal Optical Protection! If its just dust? Use duster! What Is The “Fingernail” test? Which Is The Mirror Side? Contact James With Any Questions You Have.